Tuscany is proving to be a very popular location for the destination clubs and so Quintess has just added another home in Italy's Tuscan countryside. 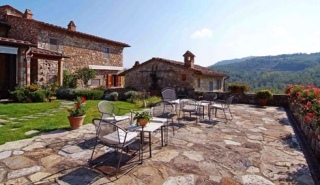 This large Tuscan villa is aesthetically traditional with modern appointments. Accented with Italian loggias, baked-clay masonry, and terracotta-marble and wood floors, the main building provides spacious accommodation for twelve guests. Six bedrooms with six full and two-half baths are laid-out amongst 6,300 square feet of living space, including the main building and a guest apartment with separate entrance, both with a private kitchen and living room. This provides plenty of room for hosting friends and family on a relaxing vacation. We can well imagine sitting on the patio (to the right) sipping a barolo or brunello and looking out over the rolling hills. The villa sits atop 23 acres of terraced hillside close to the village of Radda in Chianti, which is halfway between Siena and Florence. In recent surveys, both LUSSO Collection and BelleHavens members had Italy, and in particular Tuscany, towards the top of their lists of preferred locations. Many of the other destination clubs have homes in either the Tuscan countryside or in the city of Florence, including High Country Club, Exclusive Resorts, Portofino, Solstice and Private Escapes. This link shows you both destination club and private residence club homes in Italy, with the majority being in Florence and Tuscany.